1 of 3 Heat oven to 350 degrees F. Line a 13 x 9 x 2-inch baking pan with foil. Coat foil with nonstick cooking spray. Make Bars. Combine butter and chocolate in a microwave-safe bowl and microwave for 1 minute. Stir. Microwave another minute and stir. Microwave for 30 seconds more and stir until smooth. 2 of 3 Stir in sugar, flour, eggs, baking soda, salt and coconut extract. Pour into prepared pan; smooth top. Bake at 350 degrees F for 30 minutes. Remove to rack. 3 of 3 While bar cools, prepare Topping. Spread coconut on a baking sheet and bake at 350 degrees F for 10 minutes or until golden. In a large bowl, combine butter and confectioners' sugar. Beat until smooth. Beat in coconut extract and 2 tablespoons water. 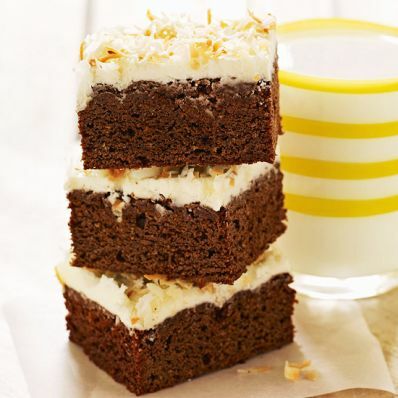 Spread over cooled bar and top with toasted coconut. Cut into squares or refrigerate until serving.